When I started birding over 16 years ago, huge flocks of scaup used to overwinter at Dead Horse Bay. Over the years the size of those flock began to decline. I even remember a few Christmas Bird Counts when we only saw a handful of these seaducks at the bay. For reasons I could only guess, this winter their numbers have rebounded dramatically. 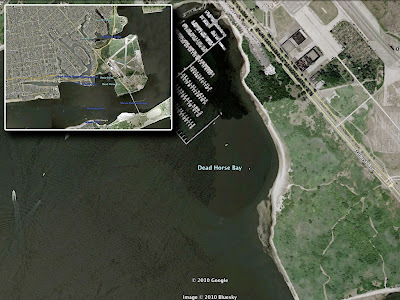 The beach at Dead Horse Bay is rarely visited by your average New Yorkers. Given it's remote location near the northern end of the Gil Hodges Bridge (aka, Marine Parkway Bridge) and unsavory past, it's completely understandable. On most days, you won't find anyone walking the trails from Flatbush Avenue or wandering the debris-strewn beach. On weekends you may find the occasional birdwatcher or beachcomber, the rest of the time the only visitors you are likely to see are Red-throated Loon, Common Loon, Horned Grebe, Brant, American Black Duck, Long-tailed Duck, Bufflehead and Red-breasted Merganser. Now the scaup seemed to have returned in epic numbers. This week I took the Q35 bus down Flatbush Avenue to the bay. When I got there I was stunned by the huge number of scaup resting in the protected cove. In addition to a large flock close to the trail's end, there was a second flock a short distance to the north, next to the Gateway Marina. A cold wind was gusting hard from the west making scanning the flocks for anything unusual nearly impossible. I pressed down hard on the top of my scope hoping to minimize vibration from the wind. Total estimate of the two flocks was around 20,000 individuals. They seemed to be composed primarily of Greater Scaup, but with such a large gathering there certainly could have been many Lesser Scaup present, as well. I'm hoping to go back again this weekend, when the wind is more manageable. Saturday January 30, 12 noon to 2 p.m.
We will look for evidence of animal life, especially deer, raccoons and other mammals in the winter woodlands surrounding Long Pond. We’ll also look for the bird life, examine the geology of the area and observe evidence of past human use of the area during this unhurried stroll through about one and a half miles of the park. Meet at PS 6, on Page Avenue and Academy Avenue about 3 blocks NW of Hylan Blvd. Saturday, January 30, 5:00 p.m. to 6:30 p.m.
Sunset is at 5:12 p.m. and moon rise is at 6:04 p.m. However, it takes the moon another 20 minutes to rise above the hills of High Rock. Meet at intersection of Rockland and Meisner Avenues. Flashlight is required for each person in your group. You may bring a light refreshment to share with others. The walk is barely twenty minutes each way. As we walk past the Rockland Avenue intersection, you will see hundreds of trees and shrubs. NYCDEP planted them to landscape the newly designed dam flood control system. Wear waterproof shoes, the trail gets muddy. Children have always enjoyed this brief walk for an astronomy event and the sharing of some refreshments at the top. The walk leader is Sandra Mechanic. For more information contact Sandra at 718-967-1037. Sunday, January 31, 6 p.m. to 8 p.m.
Meet Cliff Hagen at the corner of Fieldway and Katan Avenues for a tour of Kingfisher Pond Park at night. Follow Cliff Hagen along the trails, beside the pond, where he stops momentarily to produce repeatedly, the call of an Eastern Screech Owl, a tremulous whinny in high pitch. Repeated calls often result in distant responses. That responder may then fly to a branch overhead and continue responding to Cliff’s mimic call. For directions or more information call Cliff at (718)313-8591. It's a great time of year to observe and enjoy raptors in NYC. You can also send reports and digital image files via email to nysarc1 AT nybirds.org . Greetings. This is the New York Rare Bird Alert for Friday, January 22nd, at 9:00 pm. The highlights of today's tape are ATLANTIC PUFFIN, COMMON MURRE, THICK-BILLED MURRE, DOVEKIE, WESTERN GREBE, MEW GULL, BLACK-HEADED GULL, BARROW'S GOLDENEYE, KING EIDER, GREATER WHITE-FRONTED GOOSE and SUMMER TANAGER. Sunday's pelagic trip aboard the Captain Lou VII out of Freeport, organized by See Life Paulagics, managed to beat the bad weather and provide nice views of some good pelagic birds. Trip totals included 40 NORTHERN GANNETS, 2 ICELAND GULLS, 73 BLACK-LEGGED KITTIWAKES, 33 COMMON MURRES, 202 RAZORBILLS and 78 other large alcids, and 2 ATLANTIC PUFFINS. A HARLEQUIN DUCK was also seen along the Point Lookout ocean jetties as the boat came in. The excitement continues in Brooklyn, where the European form of MEW GULL, also known as COMMON GULL, is still being seen by patient birders through this afternoon along the Gravesend Bay promenade adjacent to the Belt Parkway. The MEW GULL is most frequently seen roosting on the grass with Ring-billed Gulls near the pedestrian bridge over the Belt Parkway that is adjacent to Bay 16th Street, where parking is usually available and enables just a quick walk over the bridge. If not roosting on the grass, look also along the shore where the gull feeds on the rocks at lower tides. On Monday at Coney Island, a WESTERN GREBE was spotted off the fishing pier and watched until dusk as it drifted east towards 2nd Street. We have no confirmed subsequent reports. 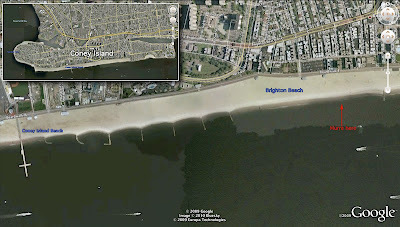 Then on Tuesday a THICK-BILLED MURRE was found near shore at Brighton Beach 5th Street, and it too drifted east. Both birds were nicely photographed and could still be in the area. A drake BARROW'S GOLDENEYE has shown up for the second winter at Jamaica Bay Wildlife Refuge, where it is generally seen in the Bay, west of the West Pond, associating with Common Goldeneye. The goldeneyes also do fly onto the West Pond on occasion, so check there as well. The SUMMER TANAGER at Clove Lakes Park on northern Staten Island was still present Monday near the west side of the white bridge, north of Martling Avenue. The Bayville BARROW'S GOLDENEYE was still present Thursday off Bayville Avenue, just before the entrance onto Centre Island, a mile east of Bayville. The Roslyn COMMON RAVENS were seen again last Friday, between 3-4pm, which appears to be a good time to see them as they come in to roost at the Nassau County Art Museum. Ninety-one REDHEAD were counted Monday on Capri Pond off Montauk Highway, Route 27A in West Islip. On the North Fork of Long Island, another drake BARROW'S GOLDENEYE was present again Wednesday along the Route 25 causeway between East Marion and Orient. An ICELAND GULL was at Iron Pier in Northville Tuesday, and 27 WOOD DUCKS were counted off Cedar Beach Road on Wednesday. On the South Fork a DOVEKIE was reported inside Shinnecock Bay last Saturday, and the adult BLACK-HEADED GULL was still in the Bonaparte's Gull flock around the inlet last Saturday, when two RED-NECKED GREBES were seen at Moriches Inlet, with good numbers of COMMON EIDER continuing at both of these inlets. Also on Saturday, seven TUNDRA SWANS were present on Sagg Pond in Bridgehampton, with two more on a field at Daniel's Lane on Fairfield Pond Road. The Further Lane field in East Hampton Saturday still had five GREATER WHITE-FRONTED GEESE and seven CACKLING GEESE in a Canada flock often found there. Probably most impressive though were the 1200 RAZORBILLS estimated moving by Montauk Point last Saturday morning. Other birds at the Point featured a drake HARLEQUIN DUCK, an ICELAND GULL, and 15 BLACK-LEGGED KITTIWAKES. On Sunday the number of RAZORBILLS was down, but still a good 323, and 4 drake KING EIDERS were also seen off the Point, along with 11 BLACK-LEGGED KITTIWAKES, and another drake KING was found at Ditch Plains Sunday, with single RED-NECKED GREBES at both Montauk Point and Ditch Plains. An ICELAND GULL was at the Montauk Harbor Inlet on Sunday, and a LESSER BLACK-BACKED GULL continues on the beach at Fort Pond Bay. Two TRUMPETER SWANS have returned to Upper Lake in Yaphank, apparently present since mid-December, and can be viewed from vantage points off Main Street. This species has not yet been added to the New York list due to issues of origin and captive breeding. Northern Shovelers are a common overwintering waterfowl in Prospect Park, so I rarely pay them much attention. It took the fresh, unjaded eyes of my friend Heydi to point out that one looked very different. 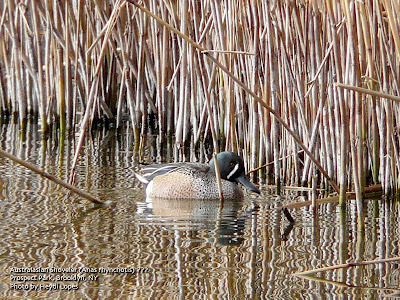 At first we thought that it was a hybrid; maybe a cross between a Northern Shoveler and Blue-winged Teal. It has the overall shape of a shoveler and the distinctive large, spatulate bill. 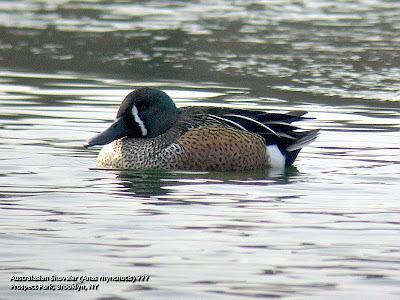 Unlike the Northern Shoveler, but similar to a Blue-winged Teal, it has a white, vertical patch on the front of its face. The Northern Shoveler also has a clean, white breast. This bird has an off-white breast with a fine, dark hatch pattern. The pattern also extends to its red flanks. I looked online for information on shoveler x teal hybrids and found a few websites with photographs of similar looking birds. Most were listed as Northern Shoveler / Blue-winged Teal hybrids. Looking up information on non-North American species of shovelers I discovered that there is an Australasian Shoveler - Anas rhynchotis. To my eye, it seems that the bird in Prospect Park is not a hybrid, but an Australasian Shoveler. I don't think that there is anyway to prove that this bird flew from Australia to Brooklyn and a more plausible explanation is that it escaped from a zoo or other private collection. It does make you wonder, though, because stranger vagrants have appeared within the borders of New York City from very distant lands. Here's a video of the Prospect Park duck. I came across this Snowy Owl recently and realized that, no matter how many times I may see one of these beautiful creatures, I'm still blown away by their magnificence. My friend Shane is on a roll. 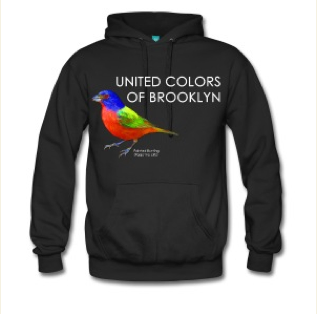 Since December he has found three rare birds in Brooklyn. His latest find is a really good one, but I think I may have him beat (for the first time). Shane's first find was a Black-headed Gull at the Water Pollution Control Plant next to Owl's Head Park. His second discovery was on the day after Christmas. During miserably wet, cold weather, he located a Mew Gull on a stretch of parkland between the Belt Parkway and Gravesend Bay. That bird is still around and, luckily, I had a chance to see it. 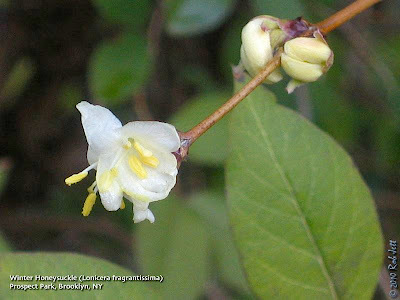 It is only the third record for this species in New York State. Shane has never been known to rest on his laurels, so on Martin Luther King Day, he went out and chalked up yet another exciting find. 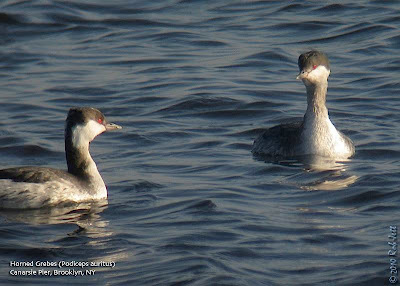 While birding at Coney Island he spotted a Western Grebe near the fishing pier. Andrew Baksh has a nice write up of this latest find on his "Birding Dude" blog here. I had to work on Monday, but on Tuesday afternoon, Heydi and I went out to try and find the grebe. We started out at the Coney Island Pier, where we scanned the water to the south and east. It was unseasonably warm and an early morning fog had pretty much burned off, but there was still a little haze remaining on the horizon. I spotted what looked like it could have been the grebe several jetties to the east. We packed up our scopes and began walking down the beach. We ran into Starr and Lenore at around West 6th Street. They were also looking for the Western Grebe but were coming from the opposite direction and heading towards the pier. After talking for a few minutes we continued on or respective routes. There were lots of Red-throated and Common Loons in the water, as well as, a few scattered Horned Grebes. We also spotted lots of Long-tailed Ducks and several Common Goldeneyes, but no Western Grebe. By the time we made it to West 2nd Street, Heydi was feeling a bit pessimistic. I made fun of her for not dropping everything and running out to the beach on Monday then sang a few lines from "Loser" by Beck. It was about a 1 mile walk from the pier to the beaches of Brighton Beach. If we didn't find the grebe within the next 1/4 mile, we'd have to end our search because the beach ended at a barbwire topped fence at the edge of Manhattan Beach. At the rock jetty closest to Brighton 5th Street I put my scope on a Common Loon that was a few yards from the shore. As I was focusing a second bird popped up to the surface in front of the loon. At first, I wasn't even sure what I was looking at. It was a small, black and white bird that reminded me of a puffin. When it dove, I noticed that it had short, chicken-like wings. I think I said something to Heydi like, "What the heck am I looking at?" Then it hit me - Thick-billed Murre! I grabbed my scope and ran down the beach to get a closer look. As Heydi ran to the edge of the water to take some photos I quickly thumbed through a field guide, just to make sure I wasn't losing my mind. In February of 2005, one showed up in the bay near the base of the Gil Hodges Bridge, in Brooklyn, but other than that individual, I'd only seen these birds in the deep ocean on Pelagic trips. The photo above is of the 2005 bird. To see Heydi's pics from yesterday, click here. Saturday, January 23, 9:45 a.m. to 3:00 p.m. The soft sounds and snows of winter should bring peace to a somber hike. Wear comfortable boots and warm clothes. Ten moderate miles, circular. We go in all weather but distance is shortened if snow levels are high. Park and meet at the end of Staten Island Boulevard, a block off Ocean Terrace, just above the Sunnyside campus of Petrides Complex. Bring lunch and adequate beverage. We often have four experienced naturalist leaders to interpret what we find, including Chuck, Dominick, Don and Sandra. For more information call Dominick at 917-478-7607. Saturday January 23, 12 noon to 2 p.m. Discover this hidden natural park in Dongan Hills. 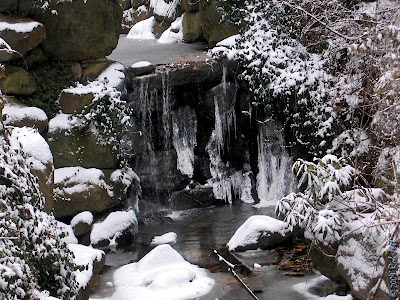 We’ll visit the three bodies of water in the park and stroll through the woodlands. Although none of Reed’s basket willow still grow near the swamp from which the park gets its name, the woodlands and streams are still home to a wide variety of flora and fauna. Meet at the Spring Street entrance in Dongan Hills. Loons, Grebes, and Buffleheads…Oh My! We'll look for secret corners of the park to photograph, so bring your cameras. I'll give you a hint - it was taken this week in Brooklyn. I love seeing goldfinches in the Spring, when their drab gray, brown and pale yellow basic plumage has been replaced by brilliant yellow and black feathers. 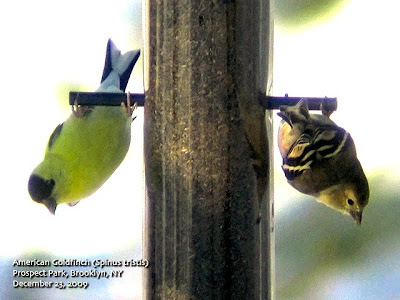 Peter Dorosh maintains several bird feeders in Prospect Park which are frequented by flocks of finches and other passerines. On slow winter birding days, I like to spend time watching the feeders from a distance. 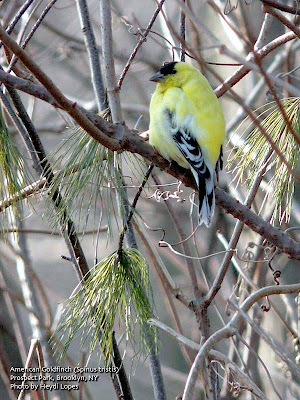 As March turns to April , one will begin to see gradual changes in the plumage of the overwintering American Goldfinches. However, while visiting the feeders one day last December I spotted this bright, yellow bird and was completely stunned. I've seen him fairly regularly since then and it doesn't appear that there have been any changes in his alternate plumage state. In the second photo you can see him side by side with an individual in the seasonally appropriate dress. While looking at the bird at close range, I expected to see a lot of damage to the feather's edges. My thought was that he'd been wearing the same feathers since he molted into them last Spring. Oddly, they all looked sharp and crisp, as if he had just molted. There is a phenomenon called suspended or interrupted molt, which refers to when a bird holds onto its feathers and molts contrary to the normal, expected cycle. Could this fellow have molted from breeding plumage into a second set of breeding plumes? Whatever the cause, he'll certainly have an advantage over his rivals come the Spring breeding season. 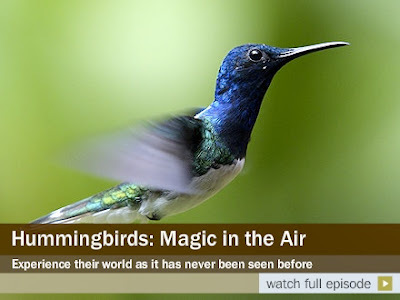 The PBS "Nature" series just ran an incredible documentary about hummingbirds. If you missed it, you can still watch it on the PBS website. It may not be like watching on your new 52", high definition television, but, trust me, it's worth sitting down in front of your computer to view. Click this link or just click on the screen grab to the right. Heydi, Shane and I all converged on Prospect Park to look for a reported juvenile Northern Goshawk. On rare occasions these and other denizens of our northern forests will migrate south and overwinter in our urban parks. The last time I got a good look at one was during the winter of 2007. I spent a little time around Payne Hill and the Ravine before I caught up with Heydi and Shane. A landscaping crew was cutting down a tree with a chainsaw in the Ravine. The whining of the saw's engine and crashing of branches would have scared away even the most tolerant hawk, so I only stayed for a few moments. After checking the woods on the Peninsula, Heydi and I headed up to Lookout Hill. Shane walked through the Lullwater and into the Ravine. 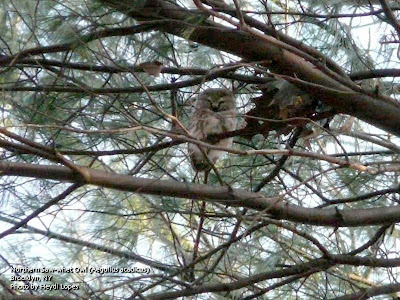 When we met up again at the Ravine, Shane was watching a raptor perched on a branch above the Ambergill. It turned out to just be a juvenile Cooper's Hawk. We watched it for a few minutes until it flew across the wooded ridge and deeper into the Ravine. I wanted to try and get a few photos, so followed it across the Rock Arch Bridge, where it was perched above the stream. Shane had to leave, but Heydi and I stayed to watch the hawk. Valerie and Isabelle had joined us and also hung around for a while to observe the Cooper's Hawk hunting close by. 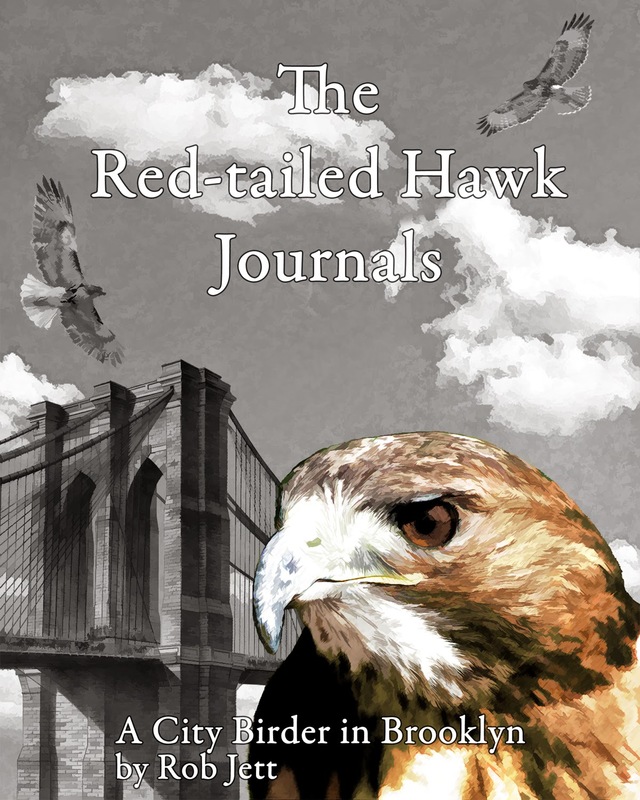 The large raptor eventually flew to a log on the steep hillside adjacent to the stairway that ascends to the Boulder Bridge. I was walking around, trying to find a good vantage point to photograph the large brown hawk when I saw something that amazed me. A squirrel had apparently been hiding under the log. Suddenly, he darted out from beneath the hawk's perch, nipped at its leg, then disappeared back under the log. The hawk jumped. I quickly set up my camera and recorded the following sequence. The Cooper's Hawk never caught the rodent so the squirrel appeared to have gotten the last laugh ... this time. I never found the goshawk, but this experience was an acceptable consolation prize. Greetings. This is the New York Rare Bird Alert for Friday, January 15th, at 7:00 pm. The highlights of today's tape are MEW GULL, BLACK-HEADED GULL, GREATER WHITE-FRONTED GOOSE, BARROW'S GOLDENEYE, YELLOW-HEADED BLACKBIRD, and more. First, the pelagic trip leaving from Freeport aboard the Captain Lou VII Sunday morning at 8am still has spaces available, so please call 215-234-6805 as soon as possible if you are interested. The adult MEW GULL hopefully continues to frequent the Gravesend Bay waterfront in Brooklyn, usually seen as it moves with Ring-billed Gulls on the grassy areas adjacent to a footbridge over the Belt Parkway, but also occasionally as it feeds along the shoreline. But a caveat: it was not seen there today. A footbridge over the Belt is adjacent to Bay 16th Street. Parking spaces can also be found on the local streets there, making it a quick walk over the bridge. Look especially at the gull flock that gathers east of the bridge. A parking area is also available mile east of the bridge, as accessed from the eastbound Belt Parkway, requiring a walk west along the promenade to the pedestrian bridge. The MEW has been seen along the promenade as well as the roosting spot at various times during the day, sometimes only making brief stops, but others much longer. Low tide may be the least likely time to find it there. The drake BARROW'S GOLDENEYE in Bayville can usually be found with COMMON GOLDENEYE east of Bayville off the causeway along Bayville Avenue just before it enters Centre Island. An immature HARLEQUIN DUCK on Sunday was in a COMMON GOLDENEYE flock off the east end of Ransom Beach, which is west of Bayville, and a GREATER WHITE-FRONTED GOOSE was with Canadas on the pond between West Main Street and Lake Avenue in Oyster Bay. In nearby Shu Swamp in Mill Neck Sunday there were over 20 RUSTY BLACKBIRDS as well as a few WOOD DUCK, YELLOW-BELLIED SAPSUCKER, HERMIT THRUSH, WINTER WREN, and other winter birds. Two TUNDRA SWANS were still at Massapequa Preserve Sunday on the partly frozen pond just east of the entrance from the eastern terminus of Pittsburgh Avenue. Other Brooklyn birds recently included LAPLAND LONGSPUR, lingering with HORNED LARKS on the cricket field at Floyd Bennett Field, and at Prospect Park such winter visitors as AMERICAN WOODCOCK Saturday, WOOD DUCK, an AMERICAN PIPIT on Sunday, and some RUSTY BLACKBIRDS. The LESSER BLACK-BACKED GULL continues on the beach just west of the fisherman's parking lot at Fort Tilden. In Manhattan a BALD EAGLE has been seen a few times around Riverside Park. Good number of eagles can be found along the Hudson up to the Bear Mountain Bridge, and others have been appearing at various locations, including on eastern Long Island. A WILLET was spotted again at Point Lookout Saturday, and look for the HARLEQUIN DUCKS along the ocean front jetties at Point Lookout. The EURASIAN WIGEON was seen again briefly Sunday along Santapogue Creek in West Babylon, south of Montauk Highway. Nearby Capri Lake contained 75 REDHEAD among other ducks. Out on eastern Long Island two BLACK VULTURES were spotted flying over Sag Harbor Tuesday afternoon, and a ROUGH-LEGGED HAWK was at the Calverton Grasslands at the former Grumman Airport Monday, when there were 400 COMMON EIDER and a LESSER BLACK-BACKED GULL at Shinnecock Inlet. In East Hampton the productive goose fields on the north side of Further Lane has in the past week produced six or more different GREATER WHITE-FRONTED GEESE and a few CACKLING GEESE, including a compact flock of seven seen together Saturday and Sunday. A drake KING EIDER was with COMMON EIDER off Ditch Plains in Montauk Sunday, joined by 26 PURPLE SANDPIPERS and a BLACK-LEGGED KITTIWAKE, with a drake HARLEQUIN DUCK there later, following one also on Lake Montauk. At Montauk Point, reports from last weekend featured a Sunday count noting 120 RAZORBILL and some other large, unidentified alcids, 35 BLACK-LEGGED KITTIWAKES, and an adult BLACK-HEADED GULL moving by with BONAPARTE'S GULLS. ICELAND GULLS included two at Montauk Inlet and one at the Point Saturday. A LESSER BLACK-BACKED GULL was at Lake Agawam in Southampton Sunday. In northern Westchester an immature male YELLOW-HEADED BLACKBIRD has been visiting feeders at the Pruyn Audubon Sanctuary at 275 Millwood Road, which is Route 133 in Chappaqua. The bird travels with Red-wings and Cowbirds and is also seen later in the afternoon. The New York Botanical Garden blog "Plant Talk" has a nice posting on our Christmas Bird Count finds. The blog has lots of great info on plants, plus occasional updates on their resident Red-tailed Hawks. I recommend checking it out. The other day I was researching something online and stumble across a copy of volume one of "Bird-Lore" magazine. Published in February of 1899 and edited by Frank Chapman, it was the beginning of the bi-monthly magazine of the newly created National Audubon Society. On the morning of May 37, 1897, equipped with an extra supply of patience and a 5 x 7 'Premo B' camera fitted with rapid rectilinear lens, my plateholders filled with unexposed plates, and accompanied by my wife, who has been a partner in all of my successful trips, I started for Otter Lake, Cayuga County, N. Y. It was a beautiful morning, with not a breath at air stirring (by the way, this is the hardest of all things to control, and is an absolute necessity if you are to make fine, clear-cut negatives of birds and their natural surroundings), and the lake looked like a mirror. It took but a minute to get the large, flat-bottomed row-boat ready for the start, and we were soon gliding along, an oar's-length from shore, scanning every tree, bush, and bunch of rushes, in search of nests, those of the Red-winged Blackbird being very plenty and placed both in bushes or rushes in about equal numbers. A pair of Kingbirds had selected as the place for their summer home, a large, low willow limb which projected over the water a peep into the nest revealed three eggs, common, yet so beautiful in their bed of wool and feathers. Our next finds were several nests of a pair of Long-billed Marsh Wrens, which looked more like mouse-nests, than anything else I have in mind. As we could return to these later, if unable to find anything better, we had not yet exposed a single plate, reserving them for a rare or unusual find. 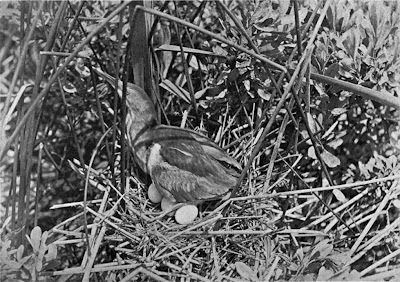 We were in search of nests of the Least Bittern, and as we were passing that part of the shore where they always nested, we soon located a nest, but as it only contained one egg, another nest must be found. A male Least Bittern flew up a short distance ahead of us and 'dropped in' back of the bushes. We rowed down to the place from which he flushed, and standing up in the boat looked around, and not more than a boat's-length ahead, we espied a female sitting on a nest. I pushed the boat very carefully to within a couple of feet of the nest, and prepared to make an exposure. The camera was set to focus on an object 34 inches from cap of lens, and I moved it back and forth until the focus was perfect, the diaphragm was closed to ƒ 16, and an instantaneous exposure with speed at 1/25" was made. As most of my operations, preparatory to making the exposure, were of necessity carried on within three feet of the bird on the nest, she at several times started to leave it but when the bird moved I kept still, and when she kept still I worked; in this way I finally completed my preparations. The peep I got of the eggs as she partly raised off from them, just as I finished, made me squeeze the bulb before I intended to; but the result I obtained fully satisfied me, for in no other way could I describe the results of this trip, and what I saw and learned of the habits and home-life of the Least Bittern. 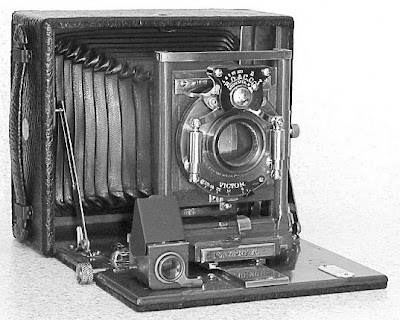 I was curious about the camera that he used and, after a short search, discovered that the "Premo B" was manufactured by the Pony company (Pony ran into some financial trouble and was eventually bought by George Eastman). The Premo B was a model camera one step down from the Premo A. According to the company's catalog, the only difference was that the "B" didn't use mahogony, but a less expensive wood. With the more expensive "rapid rectilinear lens" this camera would cost about $30. With the extra glass plate negatives, one would be carrying around about 7 pounds of camera...this doesn't included a tripod. I picture this poor man's wife paddling the row boat, then trying to keep it steady as her husband balanced and focused his huge, wooden camera, all the while attempting not to scare away the Least Bittern. I'm impressed he got the shot. I'll also never complain about my digital camera. I've been holding off posting this story because owls are a special group of birds that require a different set of considerations. Most birds are like humans, they spend the daylight hours feeding, avoiding predators and, in general, trying to make a living. At night, they sleep, regenerating their brains and bodies. Imagine what would happen if we could track down a sleeping sparrow and chase it around all night. It probably wouldn't be able to operate at peak performance come daybreak. Finding food would become a challenge, as well as, avoiding hungry predators. The same holds true for owls and other nocturnal species. Owls have a couple of things working against them when it comes to surviving in the urban environment; 1) Everybody loves seeing them and 2) they tend to stick with a preferred daytime roost. Once the location of a roosting owl begins to circulate through the birding community, it is only a matter of time before lots of people come to see the bird. Last year, at Jones Beach, it got so bad for one particular owl that the park rangers had to put up a fence surrounding the roost tree. 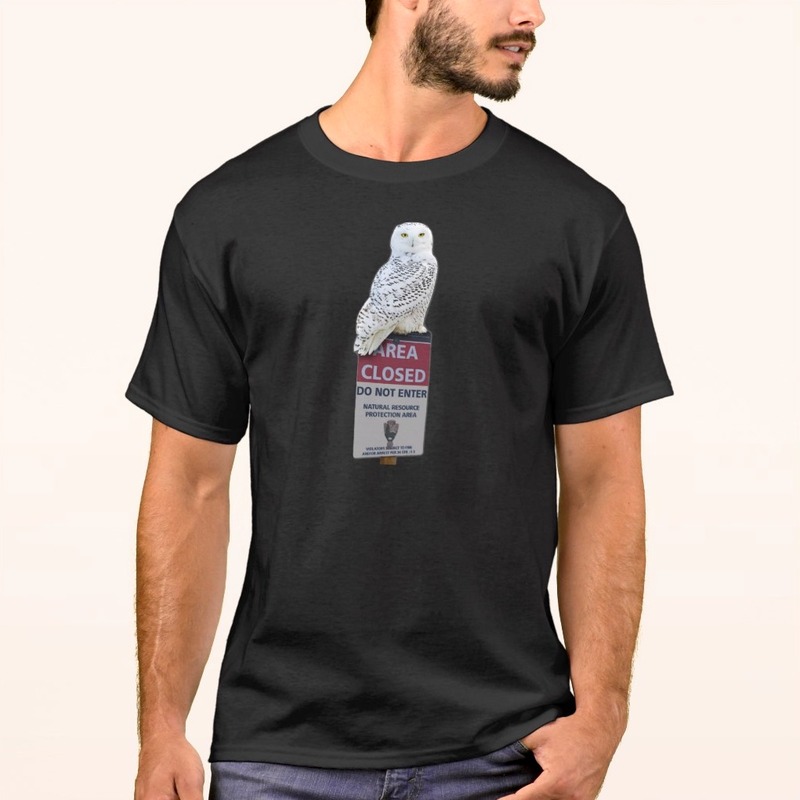 It felt like I was viewing a zoo animal when I arrived because a large group of people had encircled the "caged" owl, staying just outside the fencing. It is for that reason that I never post the location of a roosting owl and try to remain vague in my descriptions. I had been regularly checking for owls in December and, as New Year's Eve approached, decided to check a few more locations. The weather had been unusually cold, with strong northwest winds dropping temperatures all along the east coast. My gut told me that there was a very good chance that the season had deposited an overwintering Northern Saw-whet Owl somewhere in the borough. Saw-whets like to roost in dense conifers, so my first stop would be one of the few places where I'd seen one within the last 10 years. Saturday, January 16, 10 a.m. to 2 p.m.
Meet at the LaTourette bike path entrance on the Old Mill Road next to St. Andrews Church (the old one). We will walk along the bike path to the T-junction and return by the Blue Trail above where we will cut invasive vines that strangle saplings along the trail. If you don’t have your own, Protectors will supply gloves and pruners (& refreshments). Call Don Recklies at (718)768-9036 or Chuck Perry at (718)667-1393 for more information. Saturday, January 16, 12 noon to 3 p.m.
Come and explore an exciting day out. We will look at the Norway Maples, Austrian Pines, Dogwoods, Azaleas, Rhododendrons and other trees. Bring camera, binoculars and tree guide books. Use the West entrance off Snug Harbor Road at 1000 Richmond Terrace. Go a very short distance and turn into the first parking lot. Registration is a must. Contact Sandra Mechanic at (718) 967-1037. Sunday, January 17, 12 noon to 2 p.m. Learn to identify common trees in winter by their leaf scars and bark. Enjoy a walk on the trail. Look for deer or signs of them. Bring water and dress appropriately. Meet at the parking lot at the end of Carlin Ave. off Sharrots Road in Rossville. For more information call Cathy at 1-917-596-4198. Put your nature knowledge to the test! Fun for kids of all ages. Learn to identify who's who in the animal kingdom. Greetings. This is the New York Rare Bird Alert for Friday, January 8th 2010 at 7pm. The highlights of today's tape are MEW GULL, BLACK GUILLEMOT, BROWN PELICAN, BARROW'S GOLDENEYE, GREATER WHITE-FRONTED GOOSE, SNOWY OWL, a pelagic trip announcement and much more. 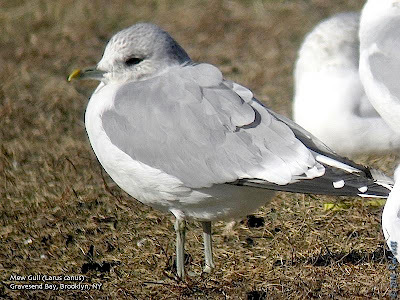 The adult European form of MEW GULL referred to as "Common Gull" has been seen in Brooklyn as recently as Wednesday and Thursday off the promenade along the Belt Parkway. Both days it appeared near or just southeast of the yellow pedestrian bridge over the Belt Parkway near Bay 16th Street. Times of sightings were around 9am Wednesday and after 10a Thursday with the bird also reported around noon each day. Its presence may be tidally related and it is thought to be best about 2 to 3 hours before high tide. This could be pinned down with a few additional sightings. So please keep noting the time and duration of appearances. Probably the best areas to park would be in a lot next to the Bensonhurst ball fields and Kohl's Shopping Center accessed from the eastbound Belt Parkway and requiring a walk west on the promenade to the footbridge or on local streets near the footbridge. High tide Saturday is around 2pm. 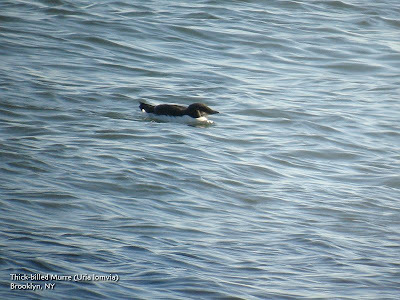 The Southampton BLACK GUILLEMOT was last seen last Friday before the area got totally iced in. 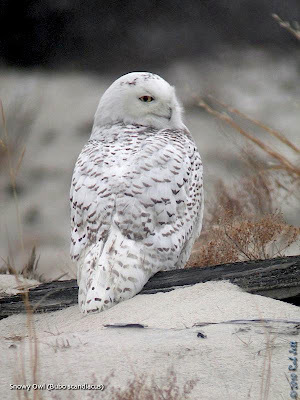 A SNOWY OWL was seen so far last Friday only on the east side of Shinnecock Inlet visible at times from the west side of the inlet. The Bayville drake BARROW'S GOLDENEYE was spotted with Common Goldeneye last Friday east of Bayville near the entrance to Centre Island it's favored location for the last couple of years. Completing what was the worst trio of Christmas Count period weekends in a long time the Southern Nassau Count on Saturday managed 122 species highlights featuring CACKLING GOOSE, 3 TUNDRA SWANS 2 continuing at Massapequa Preserve on the Pittsburgh Avenue Pond, Eurasian GREEN-WINGED TEAL on Millburn Pond in Baldwin, 254 COMMON EIDER, 8 HARLEQUIN DUCKS 6 continuing at Point Lookout, RED-NECKED GREBE, TRICOLORED HERON and 2 AMERICAN BITTERNS, 17 AMERICAN OYSTERCATCHERS, LESSER BLACK-BACKED GULL, an adult ICELAND GULL at Jones Beach West End parking field 2, 2 RAZORBILLS, HOUSE WREN, ORANGE-CROWNED WARBLER, PINE WARBLER, 4 SALTMARSH SPARROWS and BALTIMORE ORIOLE. On the Orient Count on Saturday a drake BARROW'S GOLDENEYE and a HARLEQUIN DUCK were noted along the Route 25 causeway between East Marion and Orient. The Captree Count on Sunday netted 110 species including 7 GREATER WHITE-FRONTED GEESE and a CACKLING GOOSE on the pond at Belmont Lake State Park, a TUNDRA SWAN at Connequot River State Park, EURASIAN WIGEON in West Baldwin on the Center Pond Creek, 2 VIRGINIA RAILS, ICELAND GULL, 12 TREE SWALLOWS, 29 AMERICAN PIPITS, PINE WARBLER and 2 CHIPPING SPARROWS. Birds at Clove Lakes Park on Staten Island on the 1st included 3 WOOD DUCKS and an immature RED-HEADED WOODPECKER, SUMMER TANAGER, ORANGE-CROWNED WARBLER and PINE WARBLER but recent searches for the tanager have not been successful. Other western Long Island sightings have featured an ICELAND GULL at the Fort Tilden fisherman's lot last Friday, a LONG-BILLED DOWITCHER and WILSON'S SNIPE at the Massapequa Preserve Pond on Sunday and a LAPLAND LONGSPUR at Jones Beach West End Monday. A BLACK-HEADED GULL was seen again at the Owl's Head waste water treatment plant in Brooklyn last Sunday. An ICELAND GULL visiting Gravesend Bay in Brooklyn was seen to Tuesday and a LAPLAND LONGSPUR was on the Floyd Bennett cricket field Thursday. And 2 surprises today, a PILEATED WOODPECKER in Manhattan around West 21st Street early this morning and a BROWN PELICAN flying east past the Marine Park Saltmarsh just after noontime. Father east on the north fork an adult ICELAND GULL was in Southold on the 1st, an immature ICELAND GULL at Iron Pier in Northville Tuesday and a GLAUCOUS GULL at the end of Breakwater Road in Mattatuck on Wednesday. Birds in Smith Point County Park in Shirley featured a dark ROUGH-LEGGED HAWK Wednesday and 7 RAZORBILLS Thursday. On Tuesday 6 TUNDRA SWANS were in a field with many Canadas near the intersection of Daniel's Lane and Fairfield Pond Road in Sagaponack and 2 BALD EAGLES were at Georgica Pond Wednesday and 1 Thursday. The See Life Paulagics pelagic trip scheduled for Sunday the 17th from Freeport aboard the Captain Lou VII needs more participants for it to go. If interested please call (215) 234-6805 as soon as possible as the cutoff is quickly approaching or check their website at http://www.paulagics.com/. Saturday, January 9, 9 a.m. to 11 a.m.
Meet naturalist and educator, Howie Fischer, at the parking lot near Hylan Boulevard with your binoculars and warm, winter wear for the cold, winter conditions. We will look for waterfowl in and around the park as well as the usual flock of wintering Horned Larks that prefers the grassy areas near the parking lot. If all goes well we may find a Longspur or Snow Bunting in the mix. Hopefully, the Nature Center staff will have filled their birdfeeders so an assortment of sparrows and finches may be on order. Raptors, always present in the park, are also a possibility. Call Howie at 718-981-4002 for more information. Saturday January 9, 1 p.m. to 3 p.m.
Join Sandra Mechanic, Naturalist and Photographer for a winter scavenger hunt. If you want to relieve cabin fever, come on out and find acorns, leaves, twig buds, animal burrows, holes in trees, dried flowers, rose hips, oak and maple leaves, tree fruits and more. We will look at the Northern Catalpa and American Basswood and see why the leaves are similar. Bring a brown paper lunch bag, pencil, note paper. Meet in parking lot of Von Briesen Park on Bay Street. The park is located before entering Fort Wadsworth. On Thursday I wandered around Prospect Park in one last ditch effort to find a new species for 2009. Friday I spent 2 hours walking around the park, starting my new list for 2010. There was quite a difference in bird activity between the two days. In the Ravine, the stream was reduced to a slow trickle and ice formed a crystalline curtain below the Ambergill Falls. The woodlands were strangely quiet. Birds were somewhere, just not in that stretch of woods. The only sounds were the whistling winds and creaking of swaying trees. I followed the stream towards the Boathouse, then along the Lullwater to the Peninsula and lake. Prospect Lake was nearly completely frozen. A large flock of mostly Ring-billed Gulls kept a small bathing & drinking hole opened near Three Sisters Island. At the lake's edge where people usually feed the ducks was also a small section of open water. Practically all the resident Mallards, black ducks, odd hybrids and a small number of coots and shovelers crammed into that small area. An adult Cooper's Hawk was perched in a cherry tree at the south side of the Terrace Bridge. He was probably waiting for one of the resident pigeons to fly out from its roost under the bridge. 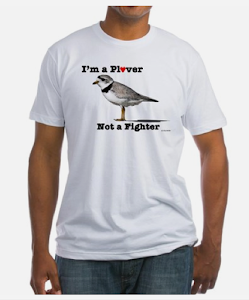 It wouldn't be much of a contest; the fast, agile accipter would easily out maneuver any Rock Pigeon. Scattered remains of pigeons can frequently be found on the Peninsula Meadow during the winter. Small sparrows and other overwintering songbirds were hard to locate around the Peninsula woods and Lookout Hill. No doubt they were keenly aware of this predator's presence. Peter's birdfeeders on nearby Breeze Hill were a target of the overwintering raptors. Despite freshly stocked seed and suet feeders, there were few birds partaking in the free food. I probably just arrived at the feeding station moments after the hawk buzzed the woods and the birds were still in hiding. While the "coops" was on the lookout for pigeons and small songbirds, one of our Red-tailed Hawks was perched on Quaker Ridge, near the edge of the Nethermead Meadow. The red-tails prefer squirrels, pigeons and doves. I never noticed them spending much time monitoring the birdfeeders. Either nuthatches, sparrows and finches don't interest them or they are too difficult for these hulking raptors to capture. 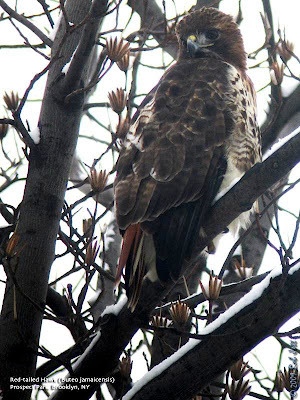 The dark-faced hawk perched in the tuliptree looked like "Alice" - the female of the Ravine-nesting pair. She was scanning the floor of the woods and the bridle path that edges the forest. 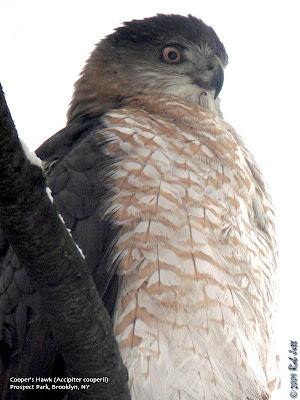 After several minutes, I heard the red-tails familiar "keeerr" call coming from the direction of the Midwood. She took off in that direction, where she presumably met up with her mate. The weather on New Year's Day was much milder. The melting snow and ice was turning the park's footpaths into slushy streams. Unlike the previous day, there seemed to be a sudden burst of bird activity throughout the park. The bird feeders and surrounding Breeze Hill was loaded with birds - there were the usual park residents, as well as, Yellow-bellied Sapsucker, both nuthatches, Brown Creeper, both kinglets, Fox Sparrow, White-throated Sparrow, Dark-eyed Junco, House Finch and goldfinch. There were also a couple of unexpected surprises to start off the New Year. While walking along the northern end of the Nethermead Meadow, I spotted a pair of blackbirds foraging in the exposed leaf litter. At first glance I thought that they were Common Grackles. As I got closer I realized that they were uncommon Rusty Blackbirds. 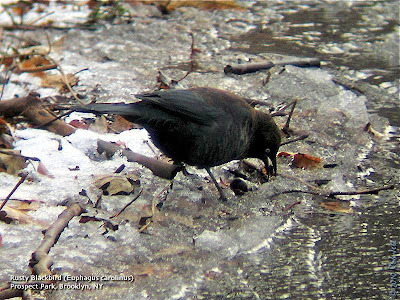 These birds will occasionally overwinter in Prospect Park, usually in areas close to the park's lake and waterways. It was a nice find, especially since their numbers have been declining throughout the country. 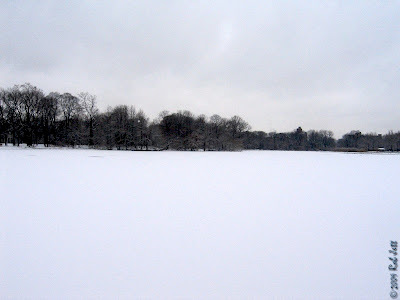 Much of Prospect Lake was still frozen and Ring-billed Gulls dominated the expanse of white. After a quick walk around the Peninsula, I headed back toward the west side of the park. As I was walking along the south edge of the meadow I noticed a small, streaky bird walking near the base of a Willow Oak. The bird bobbed its tail as it foraged in the grass. I was pleasantly surprised when I put up my bins and found that it was an American Pipit. On migration, these birds are more frequently heard than seen. 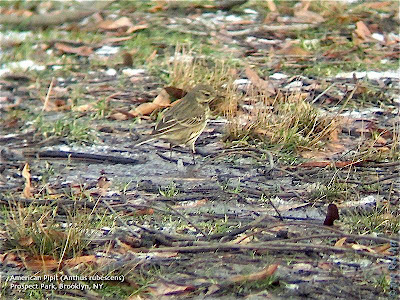 They are seldom seen in Prospect Park in January, however, on December 31st of both 1999 and 2000 a single pipit was observed in the park. Greetings. This is the New York Rare Bird Alert for Thursday, December 31st 2009 at 5pm. The highlights of today's tape are MEW GULL, BLACK GUILLEMOT, DOVEKIE, BLACK-HEADED GULL, TUNDRA SWAN, GREATER WHITE-FRONTED GOOSE, RUFOUS HUMMINGBIRD and SUMMER TANAGER. Last Saturday in miserable weather a MEW GULL was found roosting on a ball field at Bensonhurst Park in Brooklyn. This gull, perhaps the same individual present in Brooklyn back in April 2007, appears to be the European subspecies known as Common Gull and has been present along the Gravesend Bay waterfront at least through Wednesday. To look for the gull the best option would seem to be to park in a rest area lot accessed off the eastbound Belt Parkway that is just west of Bensonhurst Park and the Kohl's Shopping Center [Caesar's Bay Bazaar] and adjacent to 20th Avenue. The gull has been seen at a few locations west of this lot up to a footbridge that crosses over the Belt Parkway just west of Bay 16th Street. A promenade along the water provides viewing access to Gravesend Bay. Watch for flocking Ring-billed Gulls and it has been suggested that 2 hours before high tide might be a good time to search. A very interesting apparently high eastern Canadian Arctic form of BLACK GUILLEMOT found on the 19th off the north section of Southampton was still present off the end of Sebonic Inlet Road on Wednesday. This impressively white individual has been staying near the narrow channel connecting Bull's Head Bay with Peconic Bay. But the channel has recently been choking up with ice jams. When open this site provides wonderful views of the guillemot. To reach this site from Route 27 in Southampton College go north on Tuckahoe Road, pick up Sebonic Inlet Road and take it to its end at the inlet which is just east of the road. The guillemot is often with Long-tailed Duck and Bufflehead. A small wreck of DOVEKIES occurred on eastern Long Island last Sunday due to the storm with 3 individuals found from Hither Hills State Park to West Hampton. These birds were rescued and returned to the ocean and another was seen off the west jetty at Shinnecock Inlet Monday. An adult BLACK-HEADED GULL, inadvertently left off last week's tape, was also seen with Bonaparte's at Shinnecock Inlet back on the 24th. The Northern Nassau Christmas Count last Saturday netted 100 species featuring LESSER BLACK-BACKED GULL, GREEN HERON, 2 AMERICAN WOODCOCK, HOUSE WREN, 2 CHIPPING SPARROWS and the 2 COMMON RAVENS in Roslyn Harbor in count period. The Bronx/Westchester Count Sunday among its 117 species recorded 2 NORTHERN GANNETS, 2 BLACK VULTURES, 4 BALD EAGLES, NORTHERN GOSHAWKS, 3 CLAPPER RAILS and 5 VIRGINIA RAILS, 2 AMERICAN WOODCOCK, 2 LONG-EARED OWLS and 1 NORTHERN SAW-WHET OWL, HOUSE WREN, SALTMARSH SPARROW, 4 BALTIMORE ORIOLES and 2 COMMON RAVENS seen by 3 parties as they moved down the Hudson. The Smithtown Count Sunday recorded NORTHERN GANNET, GLAUCOUS GULL and RAZORBILL. The Staten Island Count back on the 19th among its 110 species recorded CACKLING GOOSE, TUNDRA SWAN, RUFOUS HUMMINGBIRD last seen on the 24th and the SUMMER TANAGER still at Clove Lakes Park Monday. Six GREATER WHITE-FRONTED GEESE visited Belmont Lake State Park last Friday and recent TUNDRA SWANS include 2 at Massapequa Preserve in the pond off Pittsburgh Avenue last Friday and 1 at Connequot River State Park last Thursday where there was also EASTERN PHOEBE and PINE WARBLER. A LESSER BLACK-BACKED GULL was on the ice at Wolfe's Pond Park late last Sunday. Birds off Camp Hero at Montauk Point last Monday featured 29 BLACK-LEGGED KITTIWAKES and 25 RAZORBILLS among good activity there. See Life Paulagics is sponsoring an 8 hour pelagic trip from Freeport aboard the Captain Lou VII on Sunday, January 17th. This trip will cruise near shore waters looking for murres and other winter specialties. The cost is 130 dollars. Check their website for details at http://www.paulagics.com/ or call (215) 234-6805. Have a happy and birdy New Year.